Dictionary.com provides definitions from standard dictionaries and therefore some of the explanations may be too complex for students at intermediate level. However, recorded pronunciation (American) is provided for each word. The site also includes a facility for translation between English and the world's major languages. The pronunciation of the names of many persons and places names is given on the Howjsay or Inogolo sites. The British National Corpus is is a computer database of around 100 million words of text (including both published material and transcripts of conversations). It allows the user to search for examples of the use of particular words or phrases. With the simple search function, for which registration or payment is not required, only a maximum of fifty examples will be displayed for each query but this is normally sufficient for most purposes. The Hong Kong University of Science and Technology My Words site includes a range of activities to assist in vocabulary learning. Access is free of charge but registration is necessary. You can test your knowledge of the names of major world cities with a composite satellite photo of the world at night. The brightest light patches are large cities and, if the cursor rests on one of them for a few seconds, the name will pop up. If you are interested in Old English, the form of the language spoken before about 1100, there are online lessons, with recordings of the pronunciation, on the University of Calgary site. Designed as a supplementary exercise for a textbook unit dealing with a re-enactment of the Battle of Hastings, the Powerpoint is accompanied by a worksheet with questions to be answered whilst watching it. Several of the photos used are taken from the Woodlands Junior School site, which is designed for British children aged 7-11 but also useful for lower secondary students studying english as a second language. 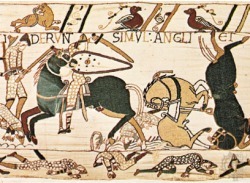 Many illustrations from the Bayeux Tapestry depiction of the battle are also included. The worksheet concludes with a follow-up assignment researching re-enactments of two other battles. A dictogloss exercise differs from a conventional dictation by requiring students not to write down as they listen but to reconstruct the whole passage AFTER they have heard it read through two or three times. They are usually provided with a lit of key words to help them to do this and, working in small groups, they are able to reproduce the gneral meaniing by pooling individual memories and also expected to work together to ensure accurate grammar and spelling. In the format use here, keywords are elicited from the class by showing a Powerpoint before the full list is finally displayed. The technique is especially useful for language-across-the-curriculum work by using passages reinforcing language content from other subjects. The Word files below include the word list and also the original passage which can be displayed at the end. Before that stage, it is a good idea to require a group which has finished quickly to present their own reconstruction either with a visualiser or by typing it into the classrooom computer. The rest of the class can then be invited to try to improve the result before the original is shown for comparison. This is an impressively detailed recalling by English teacher and jazz musician Andrew Morton of a school hike in 1965 along the River Trent and the traumatic event that interrupted it. Written when the result of the 2000 presidential election was under dispute, this spoof announcement of the USA's reversion to British crown colony status is perhaps a little childish but at the time it amused most Brits and quite a few Americans, though it may have made the author rather unpopular in Kansas. It is also a handy summary of some of the differences between British and American English. This file provides an introduction to the sounds of standard British English (RP) and to the phonetic symbols as used in modern dictionaries with older symbols also listed where they differ. There is in addition a brief outline of stress and intonation patterns and of the use of strong and weak forms. For the symbols to display properly it is necessary to install the SIL ipa93 font by downloading the second file and then launching in the normal way. Answers to the accompanying exercises are now (May 2010) being edited and will be uploaded shortly. You can hear the individual sounds demonstrated on the Baptist Lui Ming Choi Secondary School site here. For younger learners, or others who want a guide to the sounds most frequently associated with particular letters and letter combinations in the standard orthography, there is a useful chart designed by Alison Logan on the Kowloon City Baptist Church Hay Nien (Yan Ping) Primary School site here. This includes illustrations of the mouth shape for each sound and clicking on a letter lets you hear the corresponding sound in Canadian pronunciation.